In a heavy saucepan, melt butter. Blend in flour, salt, pepper and garlic powder. Stir in milk and cook over medium heat, stirring continually. Cook until mixture is thickened and bubbly. Add cream cheese, and Parmesan cheese. Remove from heat and stir constantly, until the cheeses melt. (An additional 1/4 c. milk may be added if needed.) 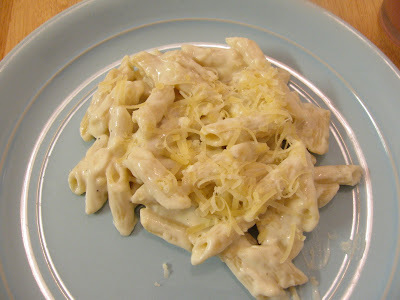 Add sauce to prepared noodles and serve garnished with parmesan cheese. Makes 2 generous servings.